components were these beautiful copper clay pieces byMelissa Meman featuring one of her own textural designs and the I got the rectangular pair to play with. My original intention was to split the pair and make to separate items but time and energy have been against me this month so in the end I opted to stick with earrings. I always love the combination of turquoise and copper so I used a pair of lampwork headpins from Maryse Fritzsch Thillens to create some drops for the bottom of the earrings. be the star of the show very well. Apologies for the colour on this picture which seems to fade during the uploading process no matter what I do. Previous AJE ‘Use Your Stash’ Challenge Reveal. Next AJE March Hare Challenge Reveal. Your earrings are gorgeous. I love turquoise and copper together. Adorable earrings! Turquoise looks perfect with those beautiful copper elements. These are beautiful. Sometimes great components don't need mcu adding. I could definitely imagine wearing these. Beautiful earrings. I love the combination of copper and blue. So earthy. 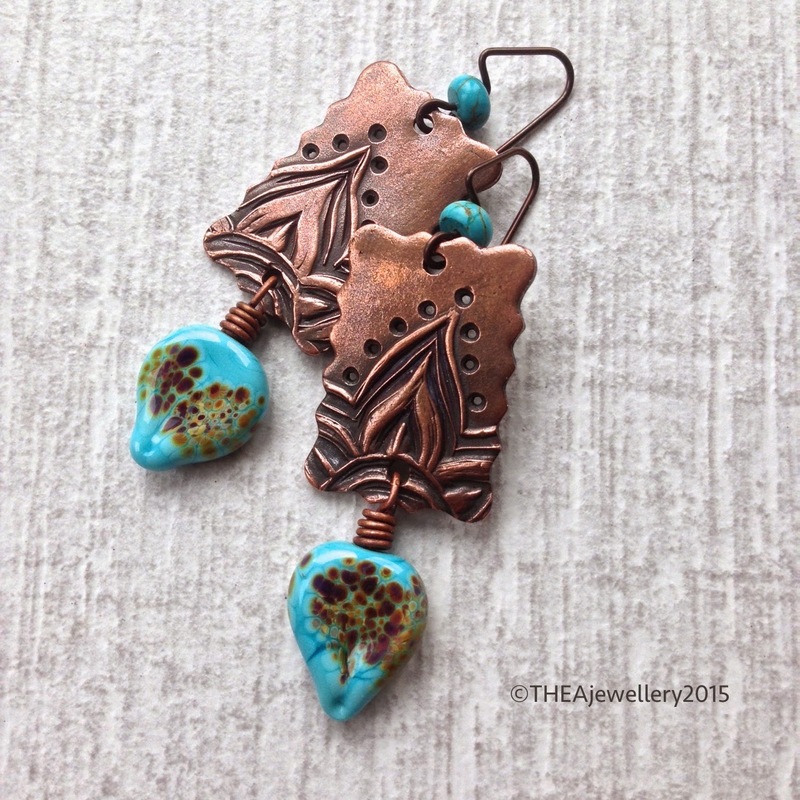 Stunning earrings Lesley, the turquoise color makes Melissa's beautiful copper clay charms pop. Yummy design, Lesley. The turquoise lampwork is perfect! Thank you so much for taking the time to create these beautiful earrings. Very sweet design – love it! Great design! The headpins and the copper play so beautifully together. Oh I LOVE these, the colours are perfect together, the shape of the lampwork headpin echo's Melissa's design beautiful and the turquoise beads at the top finish them off perfectly, addorable! I adore this color combination and those headpins are such a great match to these beautiful copper components Melissa created. I love them! Perfect design! The copper components and the lampwork headpins, the shapes and the colours match so well together. I love it! Turquoise and copper are meant for each other – perfect earrings! Love the ear wires too! They're beautiful…turquoise and copper is one of my favourite combinations and the extra touch of colour in the headpins is perfect… love them! Yup. Yummy. What else can I say! ?